If you have learned anything about online marketing and promoting your website via search, you know that keyword research forms the foundation of your strategy. The fact is keyword research is a strategy unto itself. Depending on your industry and the nature of your business, there are a number of approaches that you can take with your keyword research strategy. Finding the right keywords to focus on is critical for the success of your online campaigns. There are some key fundamentals that you should be aware of as you conduct your keyword research and work through your keyword research process. You are not going to hit the ball out of the park every time - there is no such thing as a "perfect" keyword basket. Keyword development takes work. Expect to revisit your keyword basket(s) on a regular basis. How your target audience search for something today will be different than how they search for that same something tomorrow. Each and everyone of us have a different semantic map in our mind and this semantic map continues to evolve. Realize that you will not create the perfect keyword list your first time out. The fact is you may never create the "perfect" keyword list. You cannot be an expert on everything - strictly speaking about organic keyword research, avoid having "gi-normous" keyword baskets. Remember that when optimizing site pages, ideally a single page should be optimized around a single topic. There should be a central or primary key phrase that you are optimizing for. Do not try to optimize for five or six different key phrases on a single page. Focus on one, maybe two phrases and support with relevant content. If people find this information useful, they will link to it and you should experience success with your search optimization efforts. Times they change and so will your keyword baskets - you cannot simply generate a keyword basket and leave it at that. You need to conduct keyword research throughout your campaign. Frankly you should be revisiting your keywords on a monthly basis to ensure that you are focusing on the phrases that your audience is using. There are a lot of buzzwords that come up and while I am not suggesting that you chase after all of those, you need to realize that the keywords people search for today are different that what will be searched for tomorrow. What's old is new again - ever notice that what's old often becomes new again? Trending happens and will continue to happen. Sometimes it takes generations, but what was popular once can be popular again. With regards to keywords, just because search volume has dropped for a key phrase does not mean that you should necessarily abandon that phrase. Instead build authority around it and support that phrase with what's hot. Pay attention to keyword trends, but do not abandon phrases that you have had success with in the past. Focus on your content - your keyword selection and optimization process should focus around what you know and in part focus on the content themes that are currently featured on your site. Of course you will be creating new content, but when conducting your keyword research, the keywords you select need to be relevant to your business and to the messaging that you have (or will have) on your website. Just because a phrase has high search volume and tremendous traffic potential, does not mean that it is relevant to your site or that your site has the ability to be relevant for that phrase. 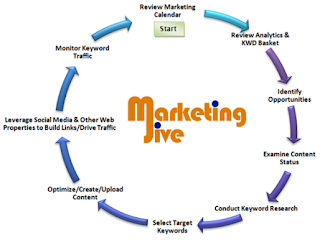 A successful keyword research strategy means that you continue to refine your keyword baskets. It means that you need to listen to your audience, review your business objectives, review your messaging (both online and offline) and it means experimenting and testing. Do not be afraid to fail with your keyword research, but if you do make sure you learn from it. Keyword selection is too important to neglect. Take your time with it and identify the phrases that will bring your desired audience to your content.